The Baptismal records for Chalfont St Giles, Bucks, record the baptism of Charles on 12th January 1806. He presumably, therefore, was borne in late 1805. Alumni Oxiensis records that Charles of Chalfont St Giles, Bucks, arm, matriculated on 28th October 1824 Trinity College, Oxford and graduated BA in 1828. 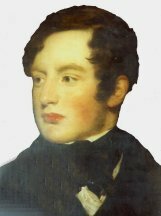 On 8th September 1832 Charles appeared personally at the Vicar General's office to obtain licence to marry Charlotte Bruce of Little Stanmore, Middlesex; Charles being of Stanmore (Great Stanmore). On 11th September 1832 Charles married Charlotte at St Lawrence Church, Little Stanmore, then Whitchurch. - John Norton - husband of Charlotte’s sister, Helen Burrington Norton. - William Kynaston Gaskell - Charles's brother. - Ann Gaskell - Charles's sister. - Elizabeth Gaskell - probably Charles's mother. - Elizabeth Ann Rouse - Charles's sister. - John Gaskell - Cousin and son of George Gaskell. - Mary Gaskell - Charles's sister or cousin, daughter of Thomas Gaskell. The marriage was also mentioned in the Gentleman's Magazine 1832. The burial of Charles' son William on 31st March 1835 and baptism of his daughter Charlotte on 9th July 1837, reveal his address as Gravel Hill, near Chalfont St Peter. Chalfont St Peter Parish Church Rate Book revealed from 4th March 1835 until 10th December 1841 Charles Gaskell Esq for Copthall. Charles signs as Guardian in January and August 1836, in March 1839 and March 1840 as principal signatory, and in March 1840 as Overseer.. Since Charles does not appear on the rates list after 1841 it can be assumed he moved to Fulmer in that year; he makes his first appearance in Fulmer in 1842. On the 1842 rates list for Chalfont St Peter, W.K.Gaskell appears and on the 1844/45 rates list the entry appears as Mifs Hibbard late Gaskell and Mifs Hibbard late C.T.Gaskell respectively. n the book "A History of Chalfont St Peter and Gerrards Cross" by G.C.Edmonds M.A. (in 1969 he was Rev G C Edmonds of The Manse, Gerrards Cross) and on page 57 is a chapter entitled "A good work house and bad management". The chapter refers to a clique running the village of Chalfont St Peter in the early part of the century and a report by the Poor Law Commission Inspector on the behaviour of the Master of the Workhouse and the Overseer - a little butcher - in running the Poor House for their own benefit. In the following year the Workhouse was sold. Amongst Poor Law Papers was found a Resolution of the Church vestry of Chalfont St Peter in 1836 to sell the workhouse, signed by Charles as Guardian. In a chest in Chalfont St Peter Church there was a note from Charles, as Guardian, to Mr Archer, Clerk to the Overseers of the Poor, dated 1836 "You are wrong to send people up to me. I have no power to order relief; the Overseers have the power. You can give him provisions - bread and cheese. Give him something for the night and order him to apply to Mr Miller at Amersham" - Mr Miller was the Poor Law Officer. There is also a Return by Churchwardens and Overseers of men qualified to serve on juries. The document is not dated but c.1838/39. The list includes the name of C Gaskell Esq., Gentleman and his qualification to be "windows" because he paid the window tax. A shorter list of voters objected to in 1839 is signed by Charles. The 2nd August 1841 Census reveals Charles living at Elm Lodge, Chalfont St Peter, with Charlotte and children William, Charlotte, Robert and Thomas aged 5,4,2 and 1 respectively. There were 6 staff listed. The 1851 Census return reveals the family then living at Fulmer House, Fulmer with Charles aged 45, Charlotte then aged 49 and borne in the E. Indies, British Subject and Annie, their daughter. 4 staff are listed - footman, cook, housemaid and nurse. Fulmer Tithe award of 1843 which shows, with a map, Charles' property amounting to 162 acres. A letter from Charles of 30th August 1845 to Acton Tindel, confirmed his wish to become a Magistrate and letter of 18th August 1845 from the Lord Chancellor’s office in London to the Clerk of the Peace for the County of Bucks confirmed the appointments of Charles, of Fulmer, in addition to three other candidates. In Nomina Magistrorum - Charles is first listed as a magistrate in 1844 - 1846 and appears for every further group of 3 years until 1858 - 1860. The register of electors for 1844/45 until 1857/58 has Charles living at Fulmer House and Farm. On 28th March 1842 Charles signs the Fulmer Church Rate Book as Chairman. He also signs as Chairman in respect of Charitable disbursements. In 1843,44 and 45 Charles is listed as an inhabitant. In 1846 he signs as Presiding Chairman and in 1847/48 he is listed again as an inhabitant. There are no names after 1848. In the Gentleman's Magazine 1858 Jul-Dec Vol 5. "At his residence, Fulmer House, Bucks aged 58, Charles Thomas Gaskell, Esq. Deputy - Lieut and Justice of the peace for that County" The age is wrong. In The High Wycombe Free Press & South Bucks Advertiser of Friday, August 20th 1858. "FULMER - on the 1st inst. at his residence, Fulmer House, Charles Thomas Gaskell Esq., Deputy Lieutenant and Justice of the Peace for this County, aged 52 years"
On the Tombstone to the left of the north entrance to Fulmer Parish Church is written. Sacred to the memory of Charles Thomas Gaskell Esq of Fulmer House who died August 1st 1858 aged 52 years. Also of Charlotte his wife who died September 11th 1880. The anniversary of their wedding aged 77 years. There is an identical reference on a plaque inside the church above the north door. 1. Pay all funeral and burial expenses. 2. Pay to sons and daughter - Robert Bruce, Thomas Kynaston, Annie - an annuity of £100 for the rest of their lives. 7. Everything goes to Charles Bruce. The will was proved on 11th February 1859 and his personal estate was stated as being under £30,000. 1. Nothing was left to his "dear wife" Charlotte, whose own money was probably adequate. 2. Obviously Charles did not get on with his eldest son Charles Bruce. See Charles Bruce Gaskell notes. 3. The date of the will looked more like 1848. It must, however, be 1858 - since, if the former date, Charlotte (daughter) would have been mentioned, who died in 1855. Thomas ATKINS/who died July 2nd 1890/aged 76 years/For upwards of 30 years a faithful/and valued servant in the family of the/late Charles THOMAS GASKELL Esq. J.P. OF Fulmer House in this County. The entry in the Gentleman’s Magazine in 1832 is found in part 2, page 264. Chalfont St Peter and Fulmer Rate Books, along with other papers mentioned, were viewed in the churches in 1969 - all records are probably now at Buckinghamshire Record Office. The High Wycombe Free Press was viewed at the Newspaper Library at Collingwood, north London.